Ruth and I picked up an eagle the other night from the airport. Another flight donated by PenAir from Valdez. 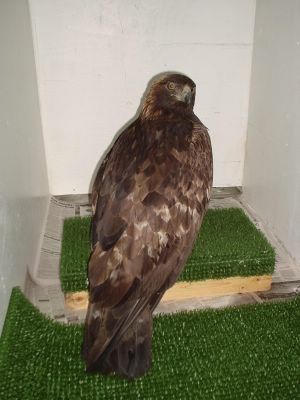 When we got it back to Bird TLC, we were surprised when we pulled it out of the shipping kennel. It is a Golden Eagle. We don't get many of those at Bird TLC. He had lost a battle with a car. A USF&W officer saw the accident happen. A car was coming down the road, the eagle had just caught a ptarmigan (Alaska's state bird) and was taking off with it. The eagle had not cleared the road or was high enough when the car came by and clipped it. The driver saw the eagle too late to do anything. The USF&W officer went back to his office and got a kennel to put the eagle in to send it to us. During examination at Bird TLC, it was noticed that his left wing was fractured. Dr Todd and Cindy Palmatier were enroute to the airport to pick up another eagle. After they arrived at the clinic, we waited until they were finished with their bird and then we discussed the golden. Dr Todd said the break was clean and looked like a good candidate for pinning and a possible release after healing. So we wrapped the wing to it's body to prevent further injury, this bird is very feisty. He said he could operate tomorrow during lunch. Yesterday during lunch, Dr Todd and Cindy did operate on the golden at The Pet Stop. They donated the operating room, x-ray, equipment and supplies needed. I was surprised that they let me take pictures. The operation took about 1 1/2 hours, but as far as we can tell now is that it was a success. A stainless stell pin was placed, but will be removed in about 3 weeks. It was an exciting experience for me. Pictures of the operation are at your right in the photo album. Click on GE 05-20. Be advised, these pictures are of an eagle being operated on. Some are a little graphic.